• An elegant matching set which includes a beautiful glazed pink rose together with a matching pink glazed pendant and pair of earrings fashioned from real miniature rose petals. 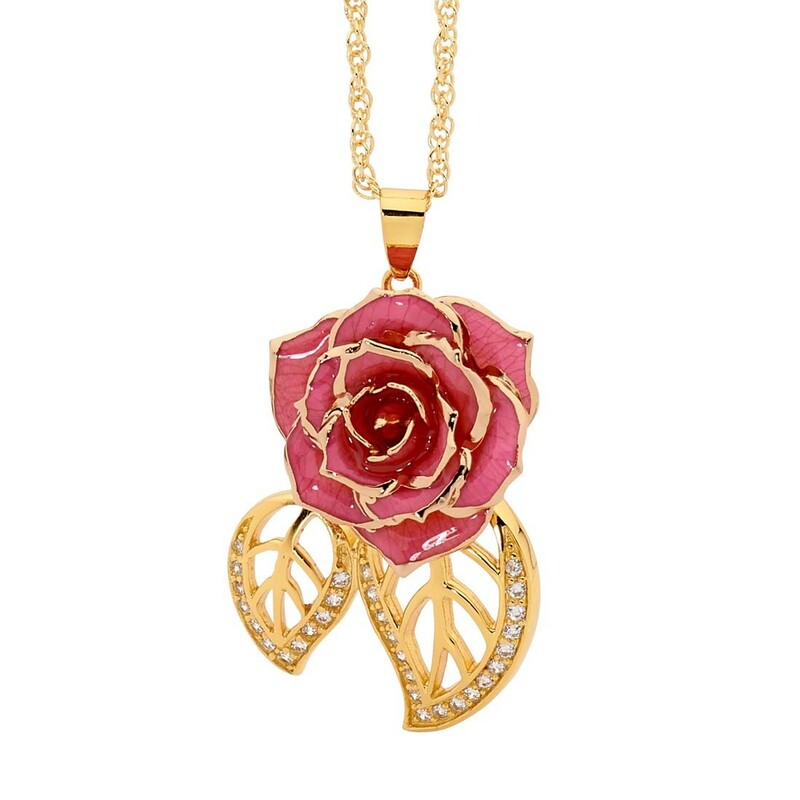 • An eye-catching pendant that features radiant synthetic diamond detailing. 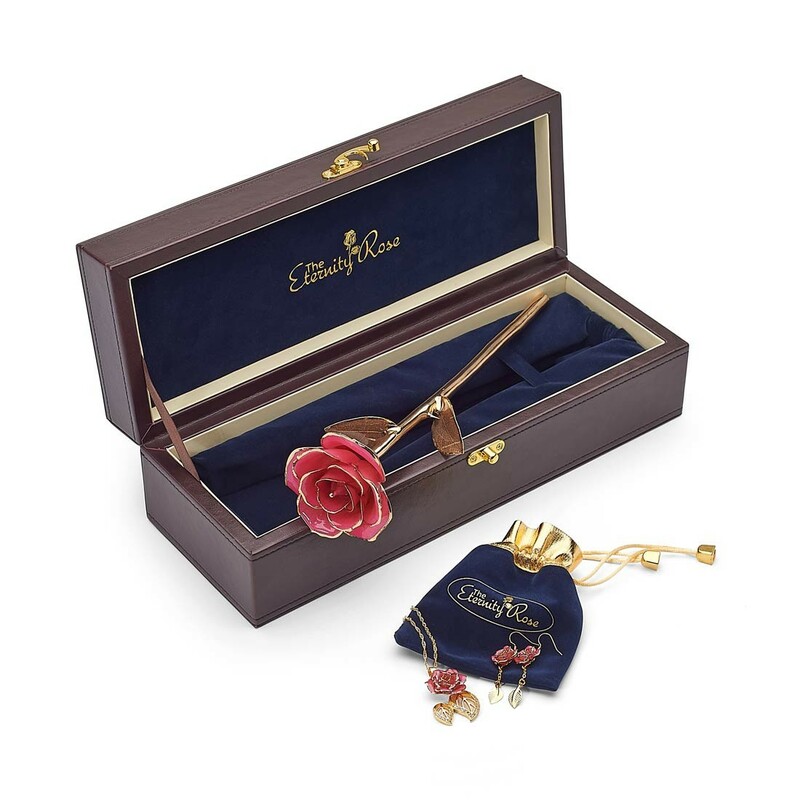 • A quality leather case is provided to display the rose, and contains a sleek navy-blue velvet pouch to contain the jewellery items. 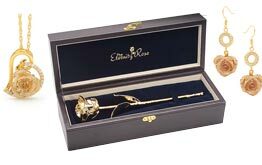 • A lifetime warranty and certificate of authenticity protect the quality of all items in the matching set. 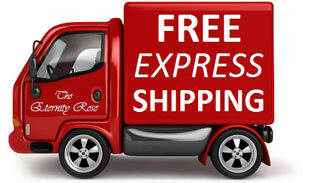 • We ensure rapid delivery in order to guarantee your order will be received on time for the important occasion. 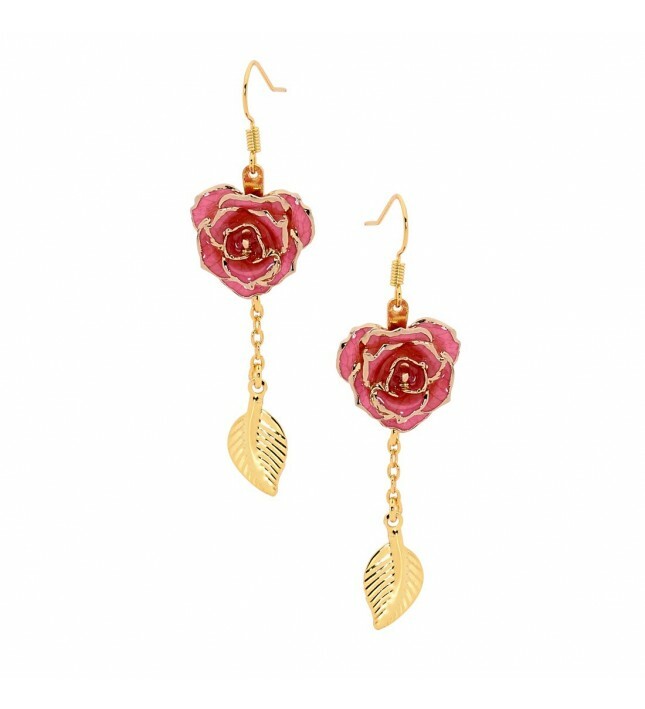 A beautiful pink glazed natural rose with lush 24 karat gold trim and glazed 24 karat gold lattice leaves. 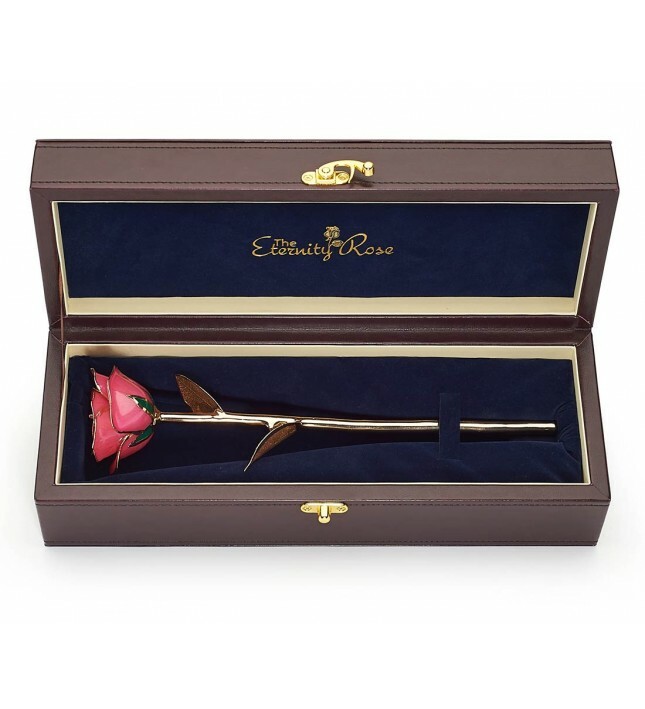 Each rose measures around 12" long. 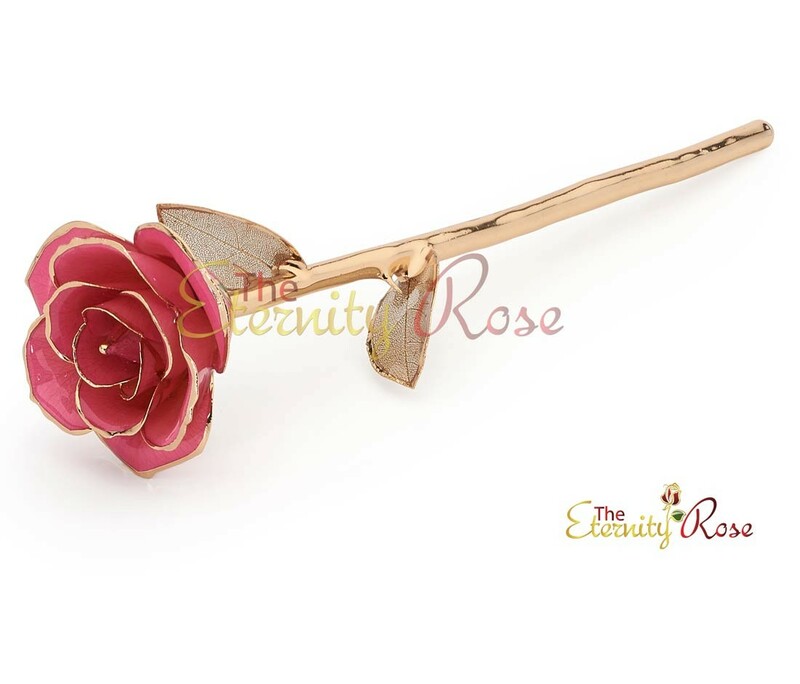 A gorgeous pendant made from natural pink miniature rose petals, glazed and edged with fine 24 karat gold. 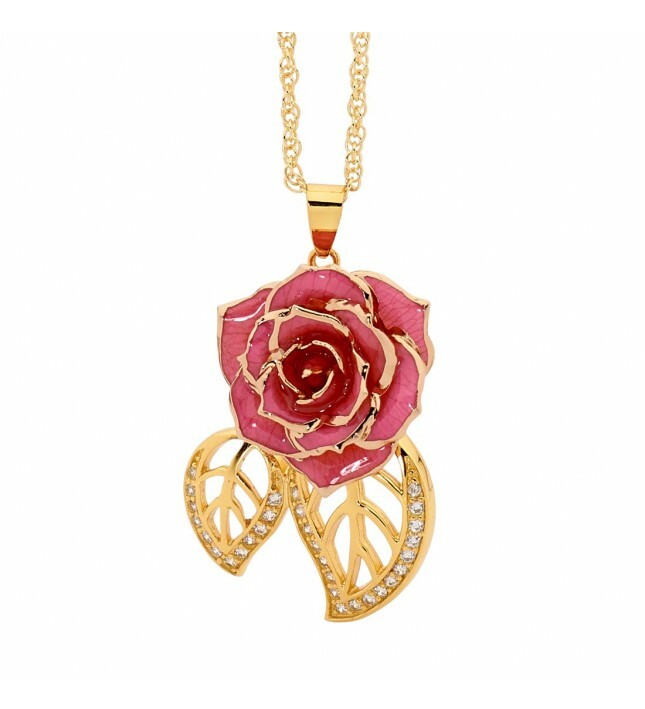 The 1.5" high pendant features a 3/4" wide miniature pink rose head and two delicate gold-plated leaf figurines as well as 30 glittering synthetic diamonds. 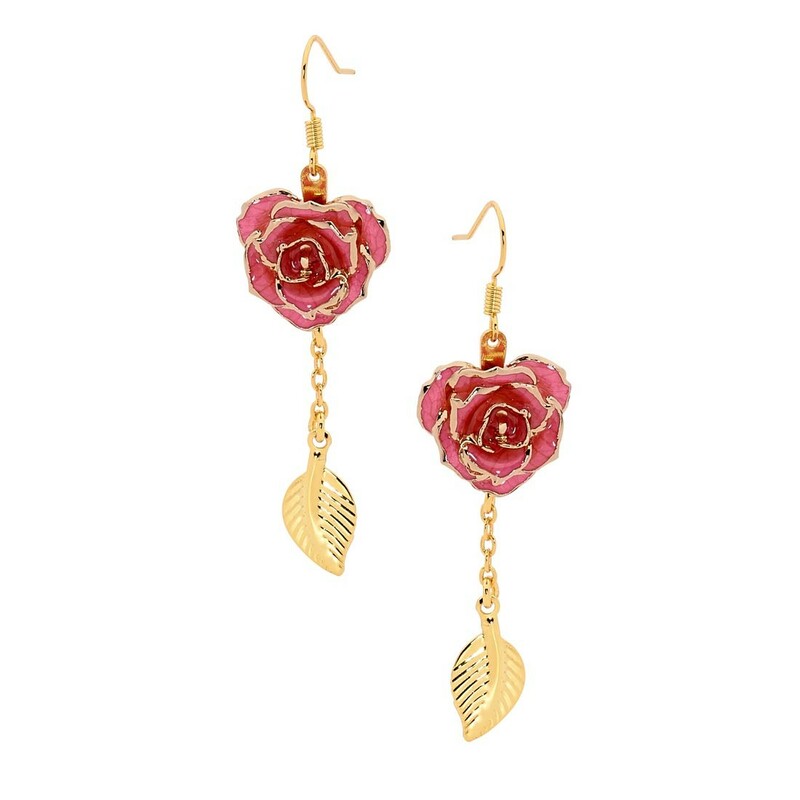 A set of stylish drop earrings with miniature rose heads that are 5/8" in diameter. 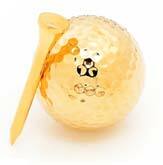 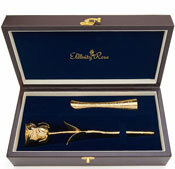 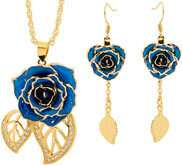 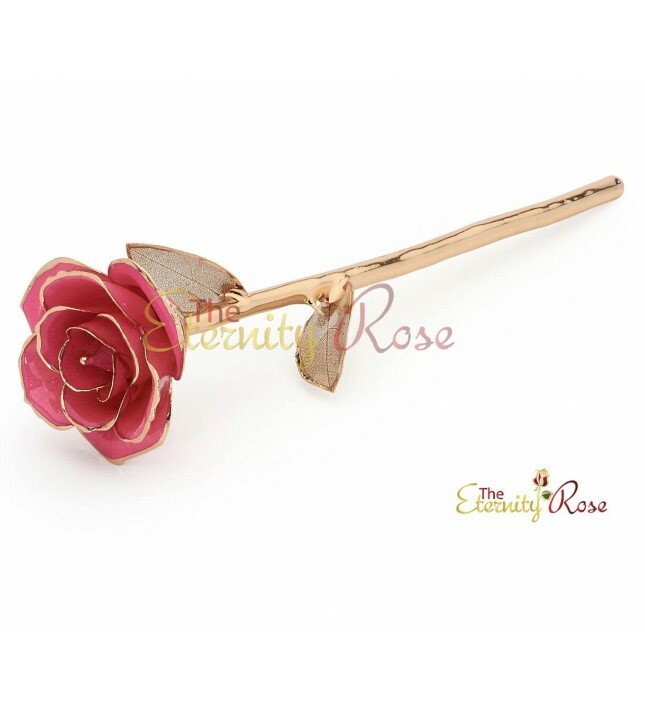 The rose heads are glazed and edged with genuine 24 karat gold and feature a pretty leaf figurine drop, measuring 1 1/4". 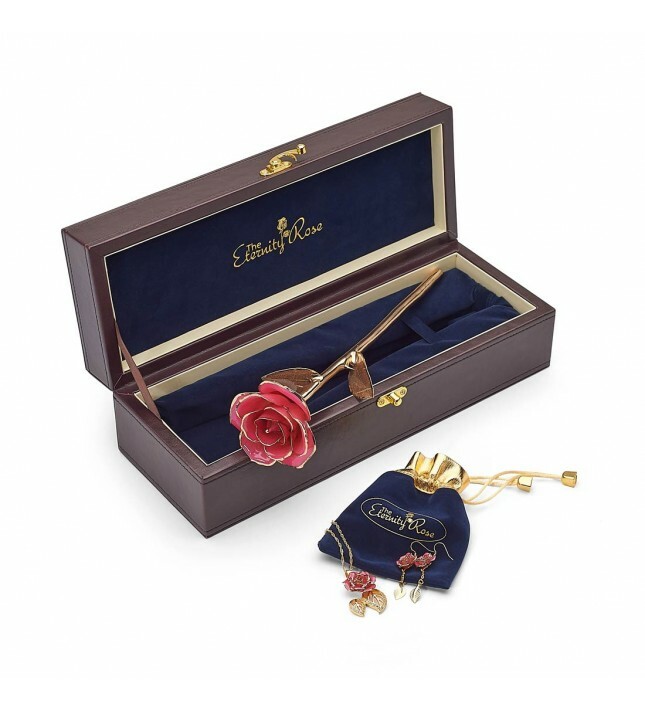 A sophisticated leather case with velvet lining is included in which to display the rose, while the jewellery is carefully tucked inside a sleek velvet pouch which is fasted with a gold silk braided drawstring. 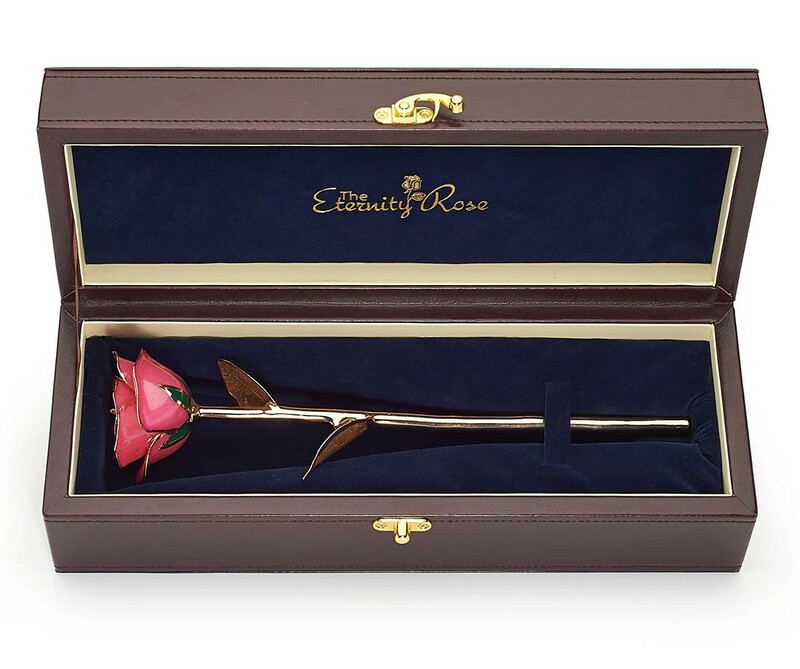 Every product of The Eternity Rose's magnificent collection is an exclusive work of art, crafted by talented craftsmen and created with skill during a complex process of 60-steps that takes three months from start to finish. 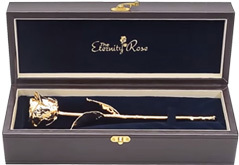 A lifetime warranty ensures the quality of each item in the collection, which has won awards for its design that is to the highest European standards. 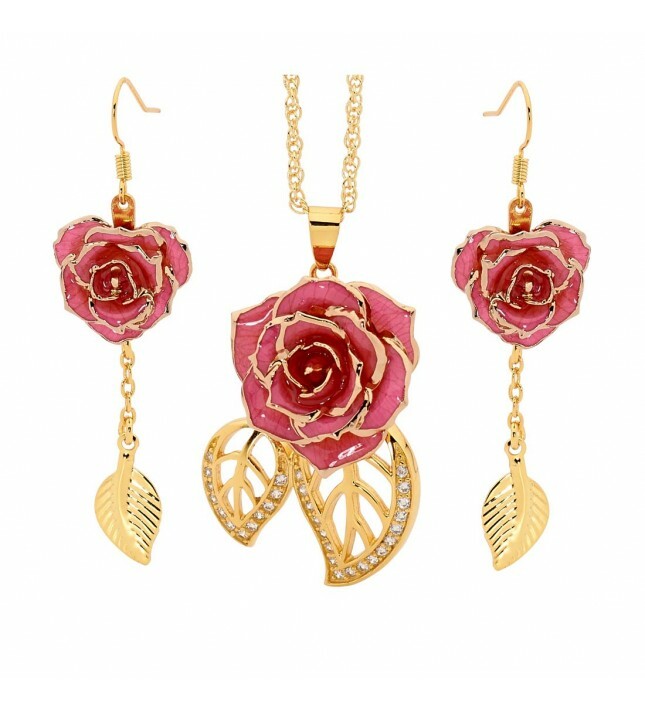 Any lady who loves the beauty of jewellery and nature will delight in the combination of these two facets in one glorious, long-lasting gift.